We had a special friend join us today on Blacks Creekm and her name is Molly the mermaid. 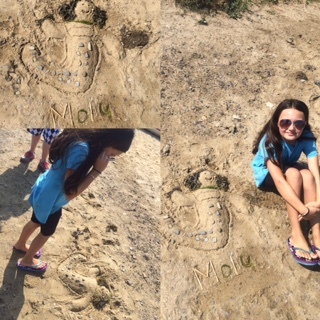 Our friend Sam took her time and built Molly on the sand. Molly the mermaid has seaweed for her hair, seaweed as her bracelet and chain. Molly also has rocks going down her stomach. Sam says that Molly has special powers and that she is the most beautiful mermaid in the whole wide world. Sam is one of are most creative kids that we have and all the other kids enjoy what she makes and I love see the creative things she comes up with every time we have her at Blacks Creek. Molly says " Hi everyone."